The employees tasked with manning the drive-thru at a Buffalo Grove, Ill., location got an unpleasant surprise at 1:23am on May 27, when the three adults they served promptly "threw the drinks at the employees and drove away," say police. CBSChicago reports that the crime could have had an unhappy ending: Though employees called police and another drive-thru customer wrote down the license plate, the car sped off ... only to return at 2:05am. The three, ages 18 to 20, were arrested; driver Martin Gutierrez had a BAC of .159. 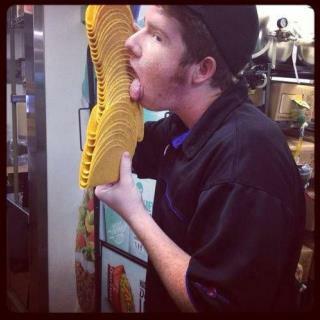 The Taco Bell worker who achieved Internet infamy this week after a photo of himself licking a big stack of taco shells made waves on social media has been suspended and will soon be out of a job, the chain announced yesterday. Consumerist reports that HQ assured the public in a statement that the shells in question were "training" shells that were never going to be served, and were in fact discarded. "Two employees, however, used them to take a photo for an internal contest in which company and franchise employees could submit for approval photos of themselves enjoying their first bite of the product. ... This image was clearly unacceptable." It actually wasn't submitted to the contest, but did make it to Facebook. Training shells? WTF , and the management tells the public because of there inventing training shells that the shells were not served to the public with the spit of a employ on them. I would say I don't believe a dam word the management of Taco Bell publishes. I would say law enforcement needs to do more then take there word for it. If they have not even fired the offending employee yet, and not filed a legal complaint against the employee for this then I would say the Taco Bell is engaged in a cover up to limit there corporate liability. This is a million dollar plus class action law suit for everyone that has eaten at that Taco Bell and even any Taco Bell seeing that they consider bio contamination of there product so trivial. Did Taco Bell never hear of Typhoid Marry? From that photo, it looks like it's an even rougher time to be a Taco Bell customer. As in, rough on the you-know-what.